Interesting that they think they can amortize an all new, completely independent, architecture. If true, it should be interesting to see what happens with a bespoke platform rather than "aluminumized" 7 Series variant. And yeah, it looks a lot like the Bentley Dominator from the mid-1990s! Too big for me, thanks. I'm sure it'll drive well and solve world hunger and all, but it's looking, to me, like the RR version of a Navigator. Well, it looks better than the Bentayga, but so do most things. Ungainly looking, but then again the people buying it only want the ornament on the hood. Too bad the front end's the worst part of the car (IMHO)! 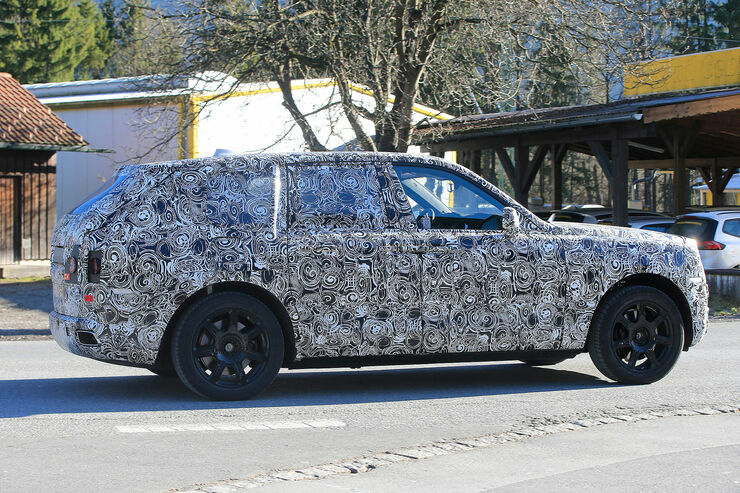 I'm also getting major Range Rover vibes from the profile, which is not a bad thing at all, IMHO. Hmm so part of the design was caught here, with the low suspension setting, it kind of looks like a wagon.